Adding more Titanium to the mix. It has been some time ago now that I added a Salsa Regulator Seatpost to my Ti Mukluk. I had heard about the nice ride imparted by titanium seat posts from close friends and acquaintances that were riding them. Everyone agreed, there was nothing like the ride quality of a titanium seat post, you gotta get one! Except that then the only ones you could get your hands on easily cost $300.00 plus dollars. Then I heard about the Salsa Regulator and since the shop was a Salsa dealer I could get one cheaper than normal. So.....what the heck! That was enough to get me to bite on a titanium post and see what the fuss was about. Well, the "fuss" was real. They do actually ride really well. I ended up running that post on the fat bike and then on the Gen 2 Fargo. I liked it so much I decided I wanted another, but there were no more and there was no ETA for when the posts would be back in stock, if they ever would be again. Then Salsa Cycles started getting out of titanium bicycles which seemed to point to them not bringing that seat post back ever again. Then I hear that they are back! Well, lucky for me that I just had my birthday and that my Mom gave me some money for a present. So......I got another Regulator. This one will be going on a special project at first. If it all turns out it may stay with this bike, but since those posts are essentially an heirloom component, I may move it around to other bicycles. I would get three more of these if I could afford it now, I think they are that good. The odd thing I think people have difficulty with is that the Regulator weighs a bit more than the other titanium posts and that it is still really expensive at almost $300.00. Well, I don't really care what it weighs, it is how it rides that matters to me. That and the fact that it is really a tough post. I've come down on mine awkwardly a few times and it shrugs it off like it is nothing. I have done a similar awkward landing on a carbon post with catastrophic results. For a "house" brand stem, these are really quite nice and fairly lightweight as well. I also picked up a couple of these shiny Dimension stems. There are a few choices for polished stems out there, but most are pretty pricey. I've owned Thomson, Ritchey, and Salsa stems all which are very nice and do the job. However; for the money, you cannot beat the value here. Plus, they are lightweight as well. I got two, since, as I say, they aren't expensive, and I have two places I need a shiny stem. One is to replace the stem on my Black Mountain Bikes rig which is also getting the new Cowbell Bar. The other is going on the same bike as the Regulator post. That bike will have a silver component scheme, as much as I can keep things silver. The bicycle industry has this infatuation with black anodized stuff that is kind of old and overdone, in my opinion. Silver can be nice too, and as far as gravel riding goes, silver, polished components seem to be easier to keep looking nice. Black ano, unless it is a high polished finish, is tough to keep from looking dingy after it has been in the dust s few times. Maybe it is just me. Maybe it is my "retro-grouch" tendencies. Whatever; I just wish that there were more nice choices in silver ano for things like hubs, rims, and stems, for that matter. River ice deposited on the trail made for some technical challenges. Saturday I had a window of time to sneak in a bit of a fat bike ride in the Green Belt. It had been quite a while since I had ridden back there due to being sick for two weeks. In the meantime it had flooded, frozen, and flooded again. It had snowed, rained, and snowed again. Sub-freezing temperatures insured that I should have no issues with mud or water, but I didn't know what the Green Belt would be like after all of the changes in weather and water levels. I decided to roll with the Blackborow DS. I had it in "high" range to start out, but after I got off the pavement I stopped and switched to "Low" range for the duration of the ride. Good thing too. It didn't take long to find the trail littered with river ice broken up and laying like broken bits of pottery all over. Big bits of pottery! Riding on them was a bit sketchy since they would tilt and shift in ways that eventually made me get off and walk for safety's sake. There was no way around these chunks of ice, so I had to gingerly step across the debris field and remount on the further side once I got there. Then onward to the bridge across the Black Hawk via the steep climb up from the recycling bins. I was put to the test, but I managed to clean that climb to Ansborough. Then I stopped to calm down the heart rate! Once calmed down, I amused some drivers by hopping the curbs and snow piles to the other side. It seems fat bikes are still capable of attracting attention despite their being much more numerous in the area now days. The trail has become a frozen river of ice in many spots. Those geometrically shaped objects on the left are more chunks of frozen river ice deposited by flooding. The Green Belt is a flooded out mess right now, but due to the sub-freezing temperatures, it is passable. As soon as the temperatures get above freezing for an extended period of time though, things will quickly become a quagmire and impassable by cyclist or pedestrian. I was glad I took the chance to get out there. Monday things are forecast to swing back above freezing far enough that the beauty of the white covered desolation will be lost, I am afraid, even if you could still get back in there to ride. I love how the crystalline structure of ice and the virgin white snow contrast against the water of the creek. The ice glowed and sparkled in the limited amount of light there was available late in the afternoon. The ride was fine with little fanfare. I just had to keep aware of where the trail was snow versus ice. Keeping my tires on the snow meant traction. Avoidance maneuvers were executed aplenty. Ice chunks from the river were seen, but not to the extent that they became an obstacle you couldn't ride over. In fact, one other fat biker and one skinny tire mountain biker had been through here ahead of me. I used their lines to gain the best way up and over the ice in several places. A view of the frozen lake in the Green Belt. When I reached the turn off for the lake loop I veered left and back up away from the creek and all the frozen ice puddles on the trail. It appeared that there had been many hikers along the trail here, and maybe a snow shoe or two, but no bicycles as far as I could tell. No more ice chunks either. Just crunchy snow under the tires and silence otherwise. It was really beautiful. There was a lone ice fisherman on the lake and when he heard my tires crunching on the icy snow he turned to look and I gave him a friendly wave which he returned in kind. Time for the lights to be turned on. I decided to take the bike trail home. I didn't come back North very far from Martin Road when I saw the remains of a deer right in the middle of the trail. A cruel reminder of the realities of nature, or maybe it was a left over from misguided hunters? Who knows. I saw no signs of blood anywhere, so maybe it was drug up out of the woods by dogs. In any case, it was a sight to behold in the wan light of the evening. After that I pushed onward to find my home in the dark. The lights were on and my wife and son had just returned from the grocery store. Back to civilization! I enjoy riding in Winter on fat bikes. I am sure glad we have that choice these days as I have always wanted to enjoy riding in Winter, but couldn't. Not with the limitations mountain bikes had up until the fat bike came around. That didn't stop me from trying, of course, and I recall thinking that a fat bike would really be great. I just never did get a Pugsley due to the fact that you had to build it up from scratch and that wasn't a very cost effective way to do things for a bike that, at the time, I thought had limited usage opportunities. Little did I understand that fat bikes were far more than just "snow bikes". But I am glad that they are that too! One size too small...... Meh! 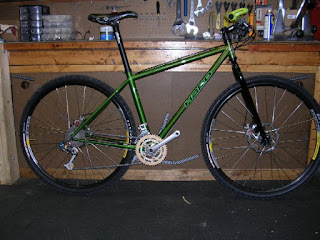 Ten years ago on the blog I debuted another, new to me, 29"er that I got as a "payment" for working up some copy on the Haro catalog the year before. This was a well thought out bike, but I went and got the thing a size too small. I have found that I typically fit better on Larges with regard to 29"ers versus the Mediums, but I really fall in between sizes. A bit to far on the "large end" for a medium and a bit too far on the "small end" for a Large. I think it is interesting to note that almost no one makes 29"ers like this anymore. Not the big brands, at any rate. There was a lot of 26"er influences here and almost none of that exists today. If this bike came out now it would be regarded as a "touring bike", or most probably a "bikepacking bike" with the negatives of no through axles and no "plus size tire" capabilities. And what the heck is that crank set? Triple rings?!! On another note, I was to receive some 2.25" WTB WeirWolf tires to test. These would be the biggest tires for a 29"er that you could get in 2007. I remember hearing, ad nauseam, I might add, that tire companies could not make a bigger tire because the mold machines could not do anything bigger. 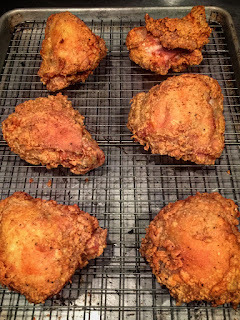 Fried Chicken: Image courtesy of Sam Auen's "Fowl Words" blog. You know, I have a history of "thinking out loud" here and there that gets me into things I never dreamed of. Take for instance Trans Iowa. That totally was a spur of the moment blurt that got me hooked into 13 years of producing the nuttiest gravel event ever. Or take that time I "thought out loud" on the blog here when I was thinking about a 29"er "meet-up" in the Mid-West. That got me into a pickle that affected many folks AND Trans Iowa. Or what about that time I posted here about how "someone should put together a gravel events calendar". Yeah.......We all know what that all led to. Suffice it to say that I probably should reconsider just putting my spur of the moment thoughts, whatever those may be, out for public consumption. I often end up sliding down another rabbit hole and fast. In fact, that happened Wednesday evening. You know......I was just sitting around, mindlessly surfing the innergoogles, as I often do before I retire for the evening, and some twisted thought just popped into my head. It's one thing to have that happen, but for some God forsaken reason, I actually posted it on Twitter. I really should know better, but, ya know, at the time I figured, "What the heck!" It was all just done in fun, as far as I was concerned. I have no idea where these twisted thoughts arise from. Maybe it is because I am originally from Charles City, Iowa. I know of several twisted individuals that came out of that village. Maybe it was too much loud music and beer in my 20's, or maybe I got a whiff of something I shouldn't have at that Motley Crue concert in the 80's. Someone needs to stop me from Tweeting late at night! So, I posted this, what I thought was, innocuous Tweet late in the evening and thought, "Meh! Nobody will notice that. Sam probably won't even acknowledge it." I figured it was a stupid thing to even suggest. I mean, Sam, of Tacopocalypse and Krunkwich Ramen House fame has a lot on his platter, so to speak. He even has plans in the hopper for other restaurants and going gallivanting around chasing down fried chicken on a bicycle...... Well! Yeah, whatever dude! I thought it would probably be received like a ding-dong comment from the nerdy kid on the back of the bus. Sam hadn't even seen the Tweet before two other folks were all over the idea. Then in the morning, more folks jumped on the bandwagon saying this should happen. Next thing I know Sam is researching places to go. What the heck! Now, maybe you are sitting there thinking that this sounds like a really cool idea and that I need to organize a ride to go eat fried chicken in some remote, small town restaurant. Yes.......that would be cool, but keep in mind that it is just an idea here and nothing more. Who knows if anything will ever come of it, but I do know that if it does, it will be awesome. I mean really..........fried chicken and gravel riding? How can it not be awesome? Those dratted SRAM bits have been removed. I spent Wednesday doing two things, mainly. One was dealing with the wet, sloppy return of Winter here. Shoveling snow which is the perfect consistency for snowman making is.......heavy work! Once in the morning, once in the evening. So, my day was sandwiched with that. In between, I did some work down in the Lab. Not cleaning this time, although that is ongoing. No, this time I did actual work on bicycles. Yesterday's menu was all about documentation and swapping parts. Mainly that was focused on my Twin Six Standard Rando. When I got the bike, initially as a review bike for RidingGravel.com, I liked the fizik handle bar just fine, even though it was based on a traditional road racing bar with no sweep or flare to the drops. However, after last Winter's shoulder injury, that bar was not comfortable for me at all anymore. I couldn't ride the Standard Rando for much more than a half an hour before my shoulder would get so painful I was in great discomfort. Flared and swept drop bars on my other bikes seemed to relieve me of this issue to a great enough degree that I considered swapping out the fizik bar to something else. First, I wanted to give my shoulder some time to recover. It did get better, but the fizik handle bar never did agree with me after the injury. It doesn't take much flare and sweep to make my shoulder feel better, the Cowchipper has plenty of both. Enter the Cowchipper Bar from Salsa Cycles. The Cowchipper is basically a "more of", the Cowbell Bar, in terms of features. More flare and more sweep. I get along with my Cowbell Bar just fine with my shoulder, but I wanted to try a Cowchipper Bar on something other than a Fargo. I know I get along with a Cowchipper Bar since I use one on my Gen 2 Fargo. So, that change was precipitated now since I had to get a bar to replace my aging Cowbell on my Black Mountain Cycles rig. (Another Cowbell Bar there, of course.) That and the Gevenalle stuff going on the Tamland made switching drive train parts and handle bars at the same time a good idea. It all came together and I made the swap of bars and bits on the drive train yesterday. I replaced the shifters and derailleurs and also replaced the cables while I was at it. Once I get my hands on a new 11 speed chain that will be installed. Then I should be good to go on gravel rides. Well......once I get clear roads to ride on, that is. That may take a while. In the meantime I decided to cruise up and down the snowy sidewalks yesterday afternoon to check how the Cowchipper would feel. And ya know what? I think we'll be getting along just fine. The Trans Iowa Masters Program route = the PERFECT antidote to RAGBRAI madness. That "big ride across Iowa" that happens every last full week of July just announced its 2017 overnight towns. As I considered the more Northerly plot of these points on the map, it occurred to me that I had already devised a near perfect gravel alternative to the late July madness that takes place on pavement. And that happened over ten years ago. I put the route out as the tenth year of Trans Iowa was passing as the "TIMP" ride. I won't get into all the back ground on that. If you want to know more, click the Trans Iowa Masters Program link in the right column. All that needs to be said about it here is that the route is 380 miles of gravel that actually traverses the entire state of Iowa, unlike that famous, other ride this year. So, as I said, the overnight towns are Orange City, Spencer, Algona, Clear Lake, Charles City, Cresco, Waukon, and Lansing. Out of those the TIMP route passes through four of them and comes close enough to two others that you could easily make alternative plans to ride gravel instead of getting caught in the traffic jam of bicycles on the "official" 2017 route. Ride the serene, beautiful gravel roads of Iowa, taking in the pastoral beauty and peace that is in abundance out there. Get away from the crowds and find an Iowa that is fast disappearing and one that is quickly emerging. Do it all without being pestered by thousands of other cyclists. Then crash the party in town in the evening. For me, it's all about the head set. Whenever I build up a bicycle from the frame and fork, I find that there is one thing that is vital to the process going forward. There is one singular component, that in my opinion, if you don't have this, you don't have a bicycle. Sure, you have to have the obvious. Two wheels, because, well......that's how the dang thing got its name. But beyond the obvious, there is one component, that if I don't have this in hand, I almost cannot do anything else on the build until I obtain it. That would be the head set. Think about it- if you you do not have the head set, you cannot have two wheels, and what you are working on is two bad unicycles until you get that part installed and mount the fork. I have to have a head set or, in my mind, there is just no use to doing anything else. You cannot string up your cables, (or in a Di2 scenario, your wires), you cannot mount your brakes with their levers, unless you don't care that they dangle without purpose. You pretty much cannot effectively do anything but mount your crank set and derailleurs. But what's the point of that without a head set? So, in my case it was my old Badger that I wanted to rebuild, but I had no head set. Guess what? I didn't do anything with that idea until yesterday when I got a hold of a used Velo Orange Grand Cru head set. By the way, what the heck is with that name? "Grand Cru? seems like there should be an umlaut over the "u" in Cru and a back catalog of hair metal music to go with that name. Hmm...... Didn't I see those guys in '88? January.....no snow, no ice, and lots of mud and water! This is a period of time now where Winter has gone AWOL and we are left with foggy, drippy, cool weather which has depleted the snow. We are now back to the "Brown Phase" and everything looks sullen and dreary. The ice storm from last week has also had all of its effects melted away, creating another issue- flooding. Since the water that melted and the rain that fell had no where to go in to the soil, due to frozen ground, it ran into all the rivers and streams instead. That has caused ice jams and flooding that is more akin to early March weather than mid-January fare. Hey, at least it isn't below zero! So, I've been back to riding just recently since being sick. I have been spending most of my time on fat bikes and will continue to do so until I feel better and especially if it snows again. It might do so Tuesday. Anyway, with the water sitting around, and with what little ice there is, it all dictates that I ride the fat bike, which is more sure-footed. It doesn't have a tendency to sink in the mire in a couple of places where I have that on my commute. I felt good enough to spend Saturday going down to see what was up at the Iowa Bike Expo in Des Moines. Plus, I got to eat lunch at Krunkwich Ramen House, which I highly recommend if you find yourself in Iowa's capital city. Anyway, following are a few of the highlights of the show from my viewpoint. I'll add a bit of commentary as we go here. Bombtrack Bikes are from Germany, but distributed out of Ames Iowa. I first came across a Bombtrack Bikes "Beyond" model that caught my eye. It is pretty much a take on a Gen I Fargo, so I was happy to actually get to take a look at one up close. The frame tubing is Columbus CroMor double butted, and seems to be a good thinner walled spec. The bike nails the vibe of a Gen I Fargo, but every time I check out the Bombtrack geo chart on this bike I kind of shake my head. A 72.5° degree head tube angle and a 38mm offset seems really weird. But.......if you load the thing down on the front wheel with gear? Maybe that is what Bombtrack had in mind. Possibly a gravel rig here? The Bombtrack Hook-2 model was also present. 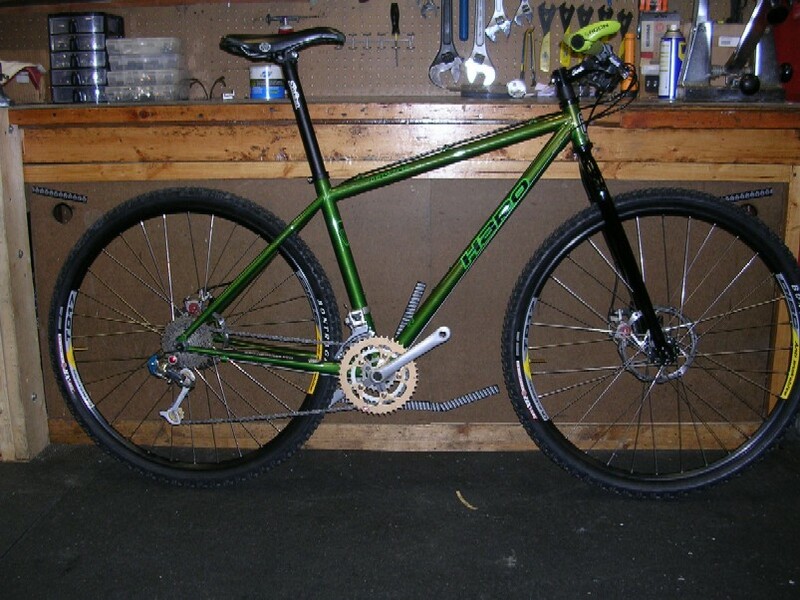 The "all-road" offering looks the part of a gravel rig, but once again, the geo chart leaves me scratching my head. The Hook has a head angle that is a half degree slacker than the Beyond, which is weird in itself, and the bottom bracket drop is merely 60mm. Way too high for my tastes. Crazy high, I would say. I took a peek at the 36mm Clements and they had just enough mud clearance to get by, but a bigger tire would be a no-go. I'm thinking this is an off the peg cyclo cross frameset here. Sure looks that way at any rate. I spied a patch of celeste blue and knew immediately that I was coming up on some Bianchis. That brand's signature color is their calling card. Fortunately, besides a bunch of road rockets, I found the Allroad, Bianchi's take on what would be good on gravel roads. The geometry is a bit too cyclo-cross-ish still, with a bottom bracket drop of 68mm and the head tube angle is 72°, which is acceptable, but not pushing any boundaries. Okay, so how's that tire clearance? My daughter liked the Cannondale 27.5+ bike on display, the Beast Of The East. The Salsa Cycles Timberjack was in the house. Later into my walk around the expo area I found the Specialized Sequoia, a bike that is getting a lot of press as a bike-packing/touring/adventure vehicle on two wheels. I was pretty curious on this one so I took a much closer look. It is quite evident once you get up close and personal that the Sequoia was meant to be a beast of burden. Big, beefy chain stays, stout tubing, and that massive front fork are obviously made to be stiff under load and track straight while carrying you on down the road. That said, a carbon fiber touring fork? We had a good time there, saw a few friends, and zipped on to other business that had to do with the rest of the family. Yeah.......we've got a lot of gravel roads here. Gravel roads are a thing here in Iowa. Due to laws passed in the 18th Century here in the US, the foundations were laid for the "grid system" to be imposed upon the lands that were to be organized for settling by the immigrants coming to the "New World". These gridded out tracts of land were to be accessed by "roads" so that settlers and government officials would have an easier time navigating the vast lands of North America that were to become the United States Of America. In the end, the roads in Iowa were "paved" with native quarried limestone or "glacial drift" that could be found local to wherever in Iowa roads were to be platted out. Obviously there were geological, political, and practical influences which informed the end result, a matrix of well over 70,000 miles of gravel and dirt roads across "The Beautiful Land". Saturday I received a t-shirt depicting all the unpaved roadways across the great state of Iowa. All 72.000 plus miles of them. To me this is incredible on several levels. That there are THAT many miles of gravel and unpaved roads. That these roads were imposed upon a bleak, unmapped prairie which was criss-crossed by a meager amount of Native American trails. 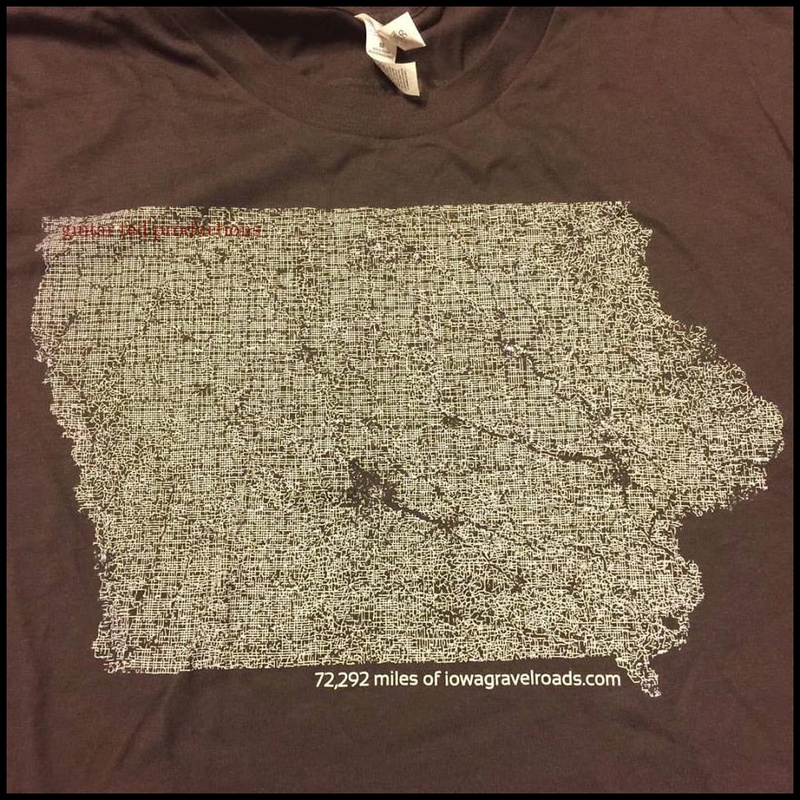 That by printing out ONLY the unpaved roads, a recognizable image of the State Of Iowa can be discerned. So, tell me, why would you NOT want to ride all these roads, which are mostly devoid of car and truck traffic? In other words, get out and grind some gravel folks! Ahh! Remember when January used to be a snowy month? Ten years ago on the blog things were a bit subdued on the biking side, and with good reason! 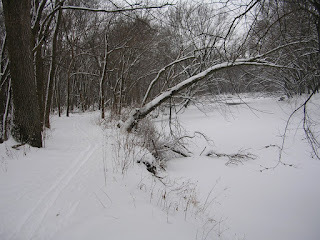 Snow was blanketing the trails and the temperatures were, well......Winter-like! Yes, there was a time when we had copious amounts of the white stuff to play around in, but of course, that was all pre-fat bikes. Dang it! So, I did XC skiing, and back in those days, you could lay down a classic style two-track from the Ansborough access all the way out to Shaulis Road and it would never get ruined by walkers or, of course, cyclists, at all. You pretty much had the woods all to yourself in those years. Of course, it wasn't too many years later when snow shoe rentals became a thing, and by 2011, fat bikes started roaming the woods and now there is no way in the world two track XC skiing would survive the Green Belt in any section. It's certainly a completely different dynamic now. One could say that "getting more folks in the woods is a good thing", and I would agree, but I also miss those quiet days in the cold snow looking at virgin white, undisturbed, snow covered trail. There was something kind of special about that. I am glad I got the chance to experience that here. I highly doubt we'll see anything like that again in my lifetime these parts. Of course, that goes without saying unless we get a real Winter again! You've probably heard by now, but just in case you haven't, it appears that Lance Armstrong, George Hincapie, and a maybe a couple of other former USPS teammates of theirs are going to do a mountain bike event coming up sometime soon. This has raised up the dander of the internetists who are concerned about the "purity of the sport". The cry of "Never! ", or the alternative, and somewhat more measured calls for "live and let live", all have been noted. Of course, it should be noted that Lance Armstrong serves a lifetime ban from any "sanctioned" events. So, there ya go folks. Cycling has served its verdict and that's that. However; you'd think that by somehow having Lance Armstrong even dare to enjoy the bicycle ever again is an affront worthy of.......I don't know. Ask these people that are getting their pants all wadded up. It is also worth noting that despite Lance Armstrong's sins against cycling, he did raise a lot of money for cancer research and brought a lot of people hope in that realm. Maybe he was a bully, or unsavory in character, I have no clue. You can find all sorts of stories about his character on the innergoogles if you want to waste your time doing that. All I know is that he is riding his bicycle in a competitive endurance event with some friends. I don't think that's going to hurt anyone. Well, I actually got back to riding the bike to work yesterday. That was a good thing and it felt awesome to ride a bicycle again after a break for being really sick. I am still not 100%, but I feel a lot better. But in the meantime, as I stated on this blog previously, Winter has taken a flier and gone somewhere else for a while. In the meantime we have had an ice storm, rain, and more rain, with some fog, then rain. This has eradicated the snow, made a lot of standing water, and that water turns into ice. In some cases, that ice gets pretty slick, and in some places, there is no way around it. You have to forge ahead. I chose "by foot" in the place I am showing here, but in a few other instances I took my chances. I was sideways more than once on the way to work. But, I made it! No dumps, no foot off the pedals. Then, while I was at work, the skies opened up. Rain on January 19th and temperatures in the 40's. Wonderful. Good thing I decided to pack the rain pants. That long stretch of ice I walked in the morning shown in the image here was drowned in two inches of water. Super slick! I was very careful when I walked back across that in the afternoon! Funny thing about frozen ground, it doesn't absorb rain water. So, there was a lot of running water and standing water puddles all over that place. The river and creeks here are all on the rise. Flooding in Winter? Could be a reality for some folks, unfortunately. Sheesh! Will Winter ever make another appearance this season? Well, that's a wrap for this week. Have a great weekend and stay warm! Trying to "garage tech" my way into a tubeless set up. Tubeless tires are really a great idea for bicycles. Really, they are. There are a lot of reasons to pursue that for your bike, and I would wager to say that the wider the tires are on your bicycle, the more vital it is that you go get those tires set up tubeless. Fat bikes, as an example, really will make that fact, (and it is a fact), better understood. So, keeping the above in mind, I will let you know when it is a bad thing to even mess around with trying to do a tubeless tire set up. The first clue you should take note of when discerning whether or not to try tubeless with your current stuff is identifying what technology it is that you possess. Old, (as in maybe only three years ago old), components like tires and rims, may not be tubeless compatible. In the fat bike world the likelihood that your fat bike came with tubeless rims or tubeless ready tires is slim to none. While you can set those kinds of things up tubeless, and you will get folks screaming it out from the rooftops that "It works!! ", there is no reason to mess with that these days. In fact, the benefits vs headaches ledger will show that converting the non-tubeless stuff to tubeless isn't at all worth it. I know, I've seen it work both ways. The main point that one should take into consideration is your time. If you do not value your time, well then......have at it. I've got better things to do than sit around taping up a special layer for a tubeless set up, or splitting a tube, to get my tires to work tubeless. Especially when there are ways to do tubeless on fat bikes that takes minutes and can be pumped up with a hand pump with the valve core still installed. Plus, you can swap tires at will. No messing up a tape job or replacing a split tube. We've got that kind of luxury today.We don't need to beat our heads against the wall and try to make something work the way it wasn't designed to work. But.....if you must know, here's the tape I used. So, here is what happened with my attempt. I spent probably 45 minutes on this, and keep in mind that the rim was pre-taped from a successfully done tubeless set up with these same components before. Oh, and that was all on one tire. I never even tried the other. I had the tire actually taking air, then the bead let loose on me and it wasn't taking air again. That's when I cut my losses. 45 minutes of messing around on one tire and rim is 35 minutes longer than it took me to set up two fat bike tires at work which were tubeless components. To me, that's a significant difference in time spent to the point that I pulled out of my attempt at this, cleaned up the one tire, and had both wheels set up with another tire set, tubed, ready to ride, in fifteen minutes. Oh, and there was absolutely zero issues getting that done. None. And it won't give me any trouble with seepage, "burping" at low psi's, and it won't need a sealant refresh down the road. By the way, the set up I did at work held air without sealant, held psi with a loss less than 5psi for both wheels for one week, and can be safely run down to lower pressures with no burping or problems at all. Why try to make my set up be what it isn't? Now, you may rightly say, "But you would have to buy a new wheel set and tires!" Yes......obviously. That isn't the point, and it shouldn't be either. The point should be, which way has a higher benefit versus time/money spent? That answer is obvious. The more correct tool for the job is going to yield a higher benefit in the end. You can cut grass with gas motor grafted on to a push reel mower, or you can just go buy a Lawn Boy and be done with it. I know which one works better and takes less time to set up and use. Okay, if you are having trouble with the title today, let me take a moment to explain. The days where I have no direction or theme for the post I write get tagged as "randomonium" posts. Yes......the word does not exist. Big deal. That never stopped me from making up words before. In fact, when I was a jeweler, my boss and I had so many made up words in our vocabulary, (that no one else understood), that my former boss' wife recently told me that it was like listening to a married couple speak a foreign language. Anyway, as I have already said somewhere, I have been sick of late. The annual January sickness, or so it would seem. I have noted that since I have been going back through the old blog posts for the "Minus Ten Review" posts I usually put up on Saturdays. This time it seems to be a double whammy of flu and head cold. Thankfully I seem to be on the upswing, and I have been very careful to get plenty of rest. Lots of fluids too, and the good kinds even! Water, apple cider vinegar, orange juice, and a bit of coffee here and there. A bit more progress in cleaning up has been accomplished since I can't be out riding. That means I have not been riding at all. Oh..... I sneak in a bit of a ride at work when I am there by riding around the showroom floor. But mainly, it has been a dry spell, and I have not liked that one bit. That said, there are two things that I can point to as sort of silver linings in the black cloud of no riding, as it were. One is that I have been able to make a lot of headway in clearing up the shop in the basement that I typical refer to here as "The Lab". I saw a recent post by some hot shot blogger, (Hi Dicky! ), that said he had a box of stuff he needed to get rid of. I bet I have a pick-up load, easy. I do not mean to brag, and I am not exaggerating the pile I have. In fact, it is a downright shameful thing to have been sitting on all this junk all these years, but I have declared war on boxes of "stuff", and even cans of stuff, and tool boxes of stuff, and...well......you get the idea. I won't even get into the four foot high pile of tires I moved out to the garage for now. Oh......I should say that there are actually two piles that high! When warmer weather finally occurs and I can manage to plan the 26 missions my Big Dummy will have to fly to carry out its part in this war, then I will be moving this stuff down to the local bike collective. Some of it is metal scrap, some is just getting the boot outta here. But anyway..... Point is that progress is being made and I have a plan to get free from the piles of stuff that has collected over 20 odd years. The snow is almost gone, what we have is rotten, and it is covered in ice anyway. The other silver lining I spoke of earlier is that since I have not been able to ride the weather has gone to crap. The Winter snow has been rotted by rains, higher temperatures, and ice. 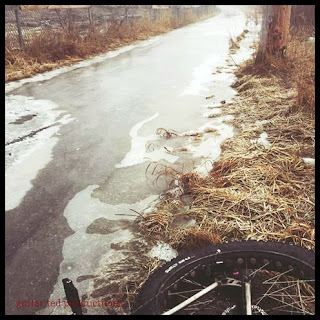 Even the two Iowa fat bike races scheduled for this weekend are cancelled, and last weekend's event was a scary, sketchy ice rutted affair, or so I've heard. So, I couldn't ride, I wouldn't ride, even if I could ride, which I cannot. Too sick still. Getting better by the day, but I am not wanting to prolong this so I am doggedly sticking to my guns. I feel like a complete slug and way out of shape, but what are ya gonna do? Besides, as I have said, it seems every January starts out this way, why shouldn't this one. That long silver line on that bar is a crack. Found on MG's personal rig recently. Failure is a topic that many of us that ride bicycles don't like to speak of. It is "negative", so you just do not speak of failure in terms of your performance. However; there is another kind of failure that we do not speak of much either. Failure of components and frames and forks. It is a very real possibility every time you ride your bicycle. 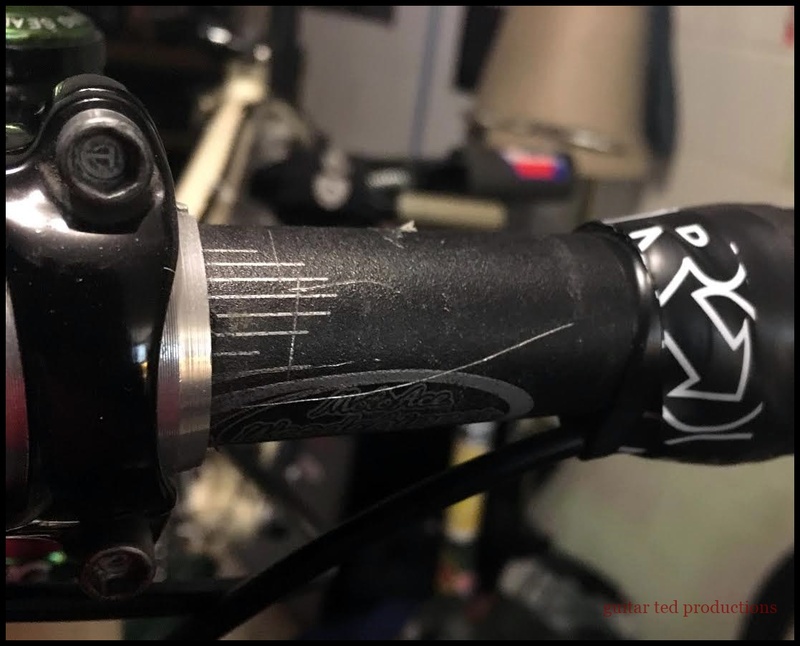 I was tipped off to a very good article covering a wide array of the topics related to parts failures on bicycles by a Twitter/blog reader contact I have. The article is by "Cyclingtips" and can be found by clicking this link. It is well written and broad based in scope. So, I feel it is a good primer on the subject for any cyclist. I am going to take a look at this from a mechanic's/rider point of view. The above link does a good job of pointing out a little bit of the following, but like any broad ranging topic, there just wasn't room there to flesh out the subject. Not from a point of view such as mine, which includes being a mechanic for over 20 years. In terms of parts and frame failures, we see a lot more crash related failures than we do the type of failure that happens from "life span" issues. Generally speaking, you can chalk that up to what the linked article points out where bicycles are sold then never really used. Crashes can constitute a lot of examples. The obvious is where there is something catastrophic, where bodily injury was inflicted, or there was obvious violent contact with something. (Roof mounted bike into a garage door, as an example.) However; I feel the most commonly found failure is due to a crash that did not seem to be a big deal at the time, but resulted in a failed component later. This can be hard to pinpoint because most of the time people file away little biffs and dings in their mental recycle bin never to be retrieved again. However; it can take only one fall to precipitate a crack in a handle bar, as a for instance, that could lead to a "catastrophic failure" later. See MG's handle bar above. He dumped his bike in a corner, then later found this crack. Had he not seen that, the bar could have "given away all at once", or so it would have seemed. The reality was that the damage was already there waiting to fail the rest of the way. I like to think of these things in terms of something that happened back in my youth when I was a jeweler. We worked on fine jewelry and manufactured custom designs which required lots of polishing to bring the fine metals up to their highest glow and sheen. To clean everything up, we used an ultrasonic cleaner, then a hot, high pressure steam bath. We would use these heavy stainless steel "tweezers" to hold the items as we blasted them with shots of steam. After we were finished, we would nonchalantly toss the tweezers into this heavy glass container we kept on the back drip edge of the sink. One late night, after one more of probably hundreds of thousands of tosses of tweezers into that glass, I sat down after cleaning something up to file it away in its envelope and move on to the next task. It was maybe 3-5 minutes later when the glass exploded into thousands of tiny crumbs. I like to think of that last tweezers toss as the final crash that "broke the camel's back", as it were. The glass continued doing its job for a few more minutes, then it "just failed". In reality, every toss of those metal tweezers was building up stress in the glass which finally resulted in the glass exploding in spectacular fashion without seeming to have any "input" to make it do so. Our bicycle parts, frames, and forks are also subject to these stresses that can eventually lead to a part failure, like the wheel I have shown here. That pulled through spoke probably had a crack next to it to begin with before it actually failed completely. Had the owner of that bike seen that crack beforehand, he could have replaced the wheel before it completely failed. Considering that most riders almost never inspect their bicycles for cracks or loose fasteners, it is a near miracle that we don't have more catastrophic injuries related to "JRA" (Just Riding Along) incidents. Consider also that hundreds of thousands of bicycles get infused into the marketplace every year. The sheer numbers of bicycles waiting to fail must be astronomic in total. That isn't to say that efforts should not be made to improve things, but we are talking about a small number compared to what it could be, in my opinion. Fat bikes, in particular, have had a rash of fork issues since becoming widely available. Another thing that has been a noted issue with failure, but not a high frequency thing, is the advent of rigid fork fat bikes. The forces at work which exert stress on different parts of a fat bike are far greater, or different, (or likely both), and have caused forks to be recalled. We've seen some subtle and some not so subtle redesigns of fat bike forks which we have replaced under warranty. Obviously, this will sort itself out, but missing the mark on design is another way we've seen failures on parts. Finally, there is the misuse of parts and bicycles. We see this a lot! Stems and seat posts extended beyond their intended insertion points, quick release levers used incorrectly, trailers loaded with cargoes way in excess of what brake and wheel systems on the bicycles that pull them were rated to. Racks affixed to carbon fiber seat posts, bags installed incorrectly, and the list goes on. It is amazing to me how much of this people get away with without catastrophic failures. So, there are another group of potential failures just waiting to happen. The point is, "life cycle" product limitations may be something worth pursuing, but don't for a second think that this will solve the potential issues with failures. There are far more modes of failure than that. The cold and flu season has caught up with us here at Guitar Ted Laboratories. So, I haven't been out on the bicycle of late, trying to recover and all, ya know. So, I kind of feel like I haven't been doing what I should be doing. My bikes have been leaning, not moving. And you know what they say about when you have time to lean. So, I was just sent some brakes and shifters from Gevenalle. The package came with a front derailleur as well. Now the plan was set all along that this stuff was going on the Tamland. That meant that I would be removing a full brake set, front derailleur, and shifters. Avid and Ultegra stuff. Nice stuff that works pretty well. So, that stuff couldn't just sit around and lean either. What to do? Well, I came up with a plan. See, there is another bicycle I have that has SRAM on it and, well, I just do not think that SRAM road stuff is very good. I held off judgment on it until I had a lot of rides on the stuff, but I can say that, for me, the SRAM road stuff is slower shifting, feels clunky compared to Shimano, and worse, the levers are much harder to actuate from the drops than Shimano's are. Now I had almost everything I needed to switch the Twin Six Standard Rando to Shimano from SRAM. Everything but a rear derailleur and a crank set. Okay, well it just so happens that I had a slightly defective long cage Ultegra rear derailleur in the bin. I looked at it and sure enough, I was able to get it to be perfectly functional. The crank? Well, that isn't going to be critical to overcoming my complaints, so that stays.......for the time being. Old school, reliable, and actually lighter than the Ultegra one. Well, enough about that, what about the Raleigh? Well, as long time blog readers here probably know, I really have enjoyed the Gevenalle, (formerly Retroshift), shifters, which ironically enough, cannot be shifted from the drops! That fact doesn't escape me, but I have learned to be able to execute shifts and return to the drops just fine, not unlike going to a downtube shifter and back. A step backwards? Perhaps. It used to be called Retroshift after all. But they are dead simple not only in execution, but also in ease of use, and quite forgiving of inclement conditions. Stick your Gevenalle shifter into a mud hole when you crash, and you can get up and go with the confidence that the sifters not only survived, but work flawlessly. Now from where I sit, that isn't a common occurrence, but copious amounts of gritty dust? That's a commonly seen issue, and Gevenalle shifters are pretty much impervious to dust and grit. Now they have mated the shifter to a TRP hydraulic drop bar lever. Hydraulic brakes? Yes. They are not 100% necessary, this is true, but they are easier to use. Less effort at the lever for better braking power? As a mechanic who has pulled wrenches for 20 + years, I'll take that advantage. I bet those who are dead tired on a ride and have to negotiate a 35mph downhill on loose gravel will also appreciate the easy modulation of a disc brake using hydraulic fluids. How these hold up, actually work in the field, and how they stack up ergonomically are things I am interested in discovering. But the weekend wasn't a complete wash because I was sick, and now, well........I cannot wait to get out riding again! Looks like I will be going down to visit this country again this Spring. First off, no- I did not get in the DK200. I didn't even try to. Actually, I was in bed sick when the whole registration thing happened and I understand that it was quite the scene. There was a new record time set for fill up, which is what I predicted. Depending upon who you believe, the DK200 was filled up, (with exception of the 200 women's spots, which took a little longer), in somewhere around 15 minutes. That's all available spots, and the "200 Women-200 Miles" category filled in about a half an hour, so I gather. So that's pretty great, yes? Well, that is a good thing that also has a "bad taste" for many who experienced internet hiccups with the registration service used by the DK200. Stories of "spinning icons", dropped registration, crashes of the site, and more were seen on social media. Some folks thought they missed out only to find a receipt showing that a credit card had been charged and then finding their name on the roster later. Some folks missed getting in but were charged for support and rooms anyway. There were some that had part of their group get in, but others did not. It gets to be kind of a tough deal when that happens to you and your friends. I'm not going to speculate as to why things seemed so difficult for the registration server, but I will say that it has become painfully obvious that there is a "frenzy" component to this event's registration that is a known, social reaction which is relevant to many retail sales situations. Think "Black Friday" madness and you can understand what I mean. I saw the same/similar thing with Trans Iowa registration. I ended up changing the way Trans Iowa does registration which has completely diffused the "frenzy" nature we had with registration and now it is completely a sane and fair process. Look, I have to be honest and say that I really liked the "frenzy" to a degree. Back when folks were sending flowers, pizzas, and cases of oil in with their registration cards, or when we were starting to get visitors dropping cards off. That was a lot of fun for me and for those associated with the shop and the event. I am sure that the excitement over the registration process is kind of invigorating for the DK Promotions folks as well. However; I think that when you see as much disappointment and such an amped up atmosphere around the process of registration, it might be a wiser thing to make the process a bit more measured, calmer, and more reasonable to those seeking spots. How would that work for the DK Promotions folks? I do not have an answer for that. I just feel the time has come for a change in the way they do the registration for this highly popular event. So, anyway, I have one good friend that did not get in and two others who did. I will once again be down there, but not as a registered rider. I'm not entirely sure about the plans for RidingGravel.com's involvement in some capacity at this juncture. There may be something I am wrapped up in having to do with this. If not, I'll probably just do my own ride again. 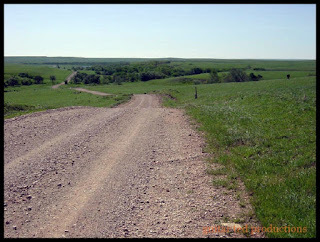 I've written many times about what it is about the gravel road riding and racing scene that I find so attractive. I've written loads about what Trans Iowa is, and what it is not. That's all well and fine, but when you see someone else put things in a little different way that helps you understand what it is you are trying to say even more clearly? Such a written document was found via Facebook the other day. It was a link to another blog. (Yes, some people other than myself blog about cycling.) In fact, it was a piece done by Craig Groseth, a talented, strong rider out of South Dakota whom I have had the pleasure of riding with. He "gets it", of course, when it comes to all this country riding, but he also knows how to wordsmith pretty darn well. I suggest that you check out his take HERE. It is well worth the time to read through. THAT trail, not "trail", get it? Ten years ago on the blog I was talking about a wide array of things, but one topic that I covered is still sorely misunderstood ten years down the road. You hear folks talk about how "None of this nit picking, micro-dissection of bicycles and geometry matters. Just ride!". Then you can find the same folks talking about how they really liked this demo bike they tried, or they really liked some different rig their friend has because it "felt so good to me!". "Say one thing, do another" much? Yes. Yes, many times they do . 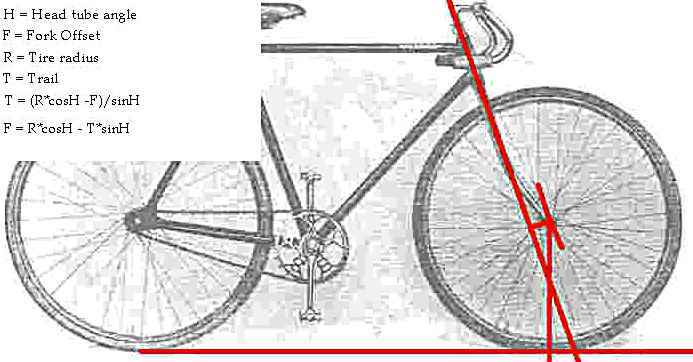 One of these areas of misunderstanding is bicycle geometry, but there are others as well. Tires are another big one, but let's stick to the geometry for now, since that is what I was writing about ten years ago. 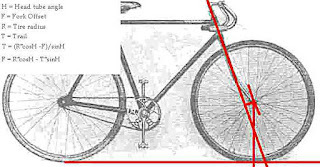 Front end geometry is probably one of the biggest contributors to how you perceive a bicycle handles. Rightly so, since your hands, two of five body contact points, are directly connected to the business end of front end geometry. They feel the results of what is going on with all those angles and whatnot. Yet many people fail to recognize this, or begin to understand how that can be such a big deal. Mere millimeters of difference in "trail", the measurement which describes the stability or lack thereof in a bike, can make a huge difference in your perceptions as a rider. Head tube angles are most often referenced in discussions about front end geometry, but that is really only a part of what really matters, which is the "trail" figure. This post a decade ago ended up becoming the catalyst for an extensive experiment I ran a year later. I took my OS Bikes Blackbuck and ran eight different forks on it all with various offsets, axle to crown dimensions, and formats. (rigid and suspended) I made every effort to keep all other fit parameters the same. It was a very enlightening experience, but I'll leave that discussion for some time down the road. 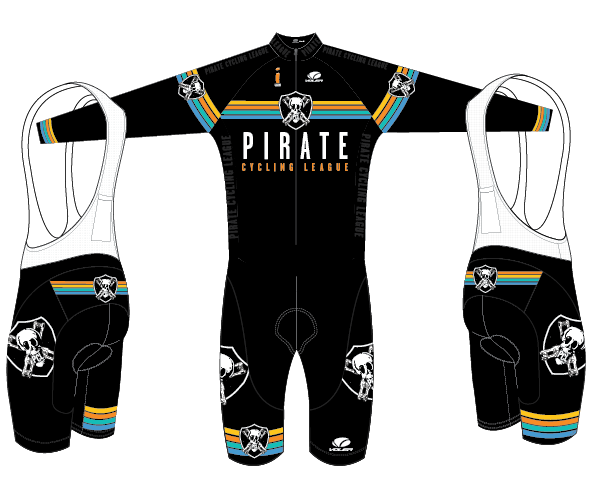 Design for the new Pirate Cycling League kits. Okay, first off, I don't know anything about how to get this, or even if you will be able to for sure, so there is that. I was tagged on Facebook by the graphic design company that did the work on this. That's all I know for sure. That said, usually around this time of the year we see a new design from those piratey-Pirates of the League. I've gotten their kits before and wear them proudly. I imagine that we will get "official word" about "how" and "when" and "how much" sometime soon. 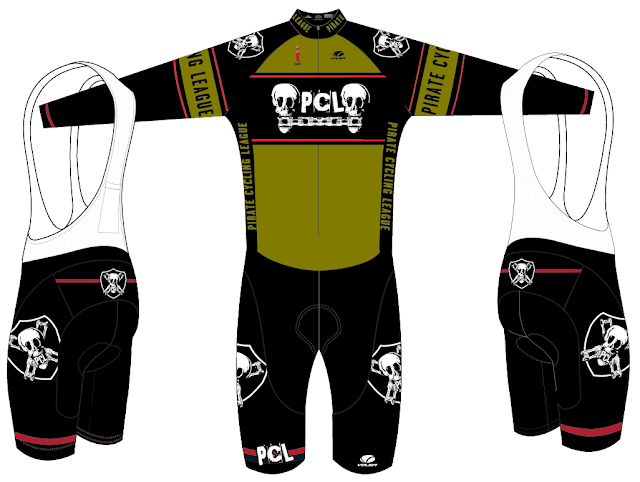 By the way, the Pirate Cycling League are the guys and gals that bring you Gravel Worlds, so you should click that link and go see the news about that event. (And the super-rad new graphics they have up) If you have ever attended the Gravel Worlds event, you know it is a "family reunion" of gravel freaks, a party, a super cool ride, and a big challenge. If you can't tell, I am a big fan of what they do and I heartily recommend that you experience the fun. I just may have to add this little number to my collection of gravel cycling wear. It would be a good way to celebrate my finish of the event last year. Or maybe I should get the "PCL Army" look. 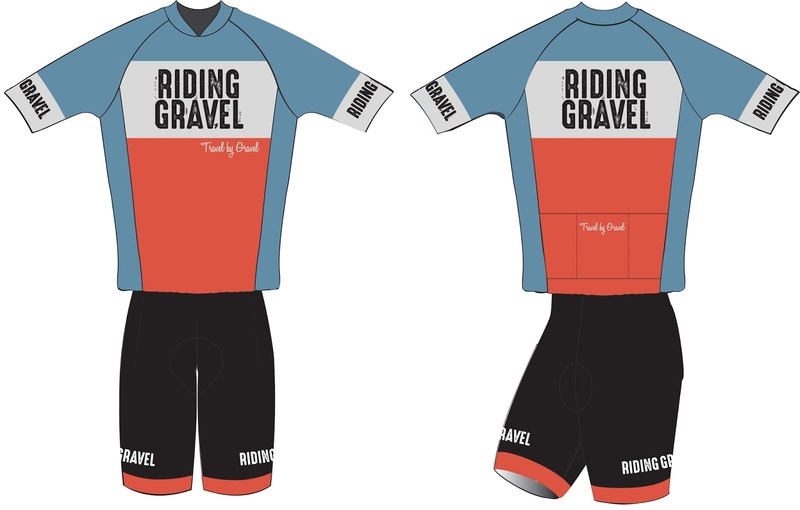 The jersey parade keeps on going here today with a bit of news about the RidingGravel.com jersey offering for 2017. Now this one I can say really will be available. The final designs were signed off on just a wee bit ago and once everything is ready to go on the manufacturing end, RidingGravel.com will put the word out on how to pre-order this jersey, bibs, vest, arm warmers, and knee warmers. This will be my main kit going into 2017 for events and organized rides, since, well.......I am part owner at Riding Gravel after all. I figured I'd better fly the colors if we had them to fly. Now we will, and others will be able to get thier RG freak on as well soon. I do know that this jersey will be a very limited time offer, so when the pre-order goes live you should pull the trigger and not waffle on this. Once the order goes in, I doubt we will do another run unless we get overwhelmed with requests. Hey.......it could happen. Realistically? Probably not, so don't bank on being able to grab one of these later. Just letting you all who might be interested know ahead of time. And also- I have no idea yet what any of the above jerseys will be going for. Yep......you guessed it! Registration is TOMORROW for the DK200, by the way. Ah what the heck! I figured I'd keep the jersey theme going. Why not?! The real info here you need to have is that the Dirty Kanza 200 registration is TOMORROW at 8:00am CST. Don't snooze yer way past 8:00am CST or you will most certainly NOT get into this event. Spots go in mere minutes once the floodgates open and I suspect tomorrow there will be a new record for sell out on the 2200 spots that span the event distances on offer. Last year the Half Pint 100 sold out in less than half an hour. 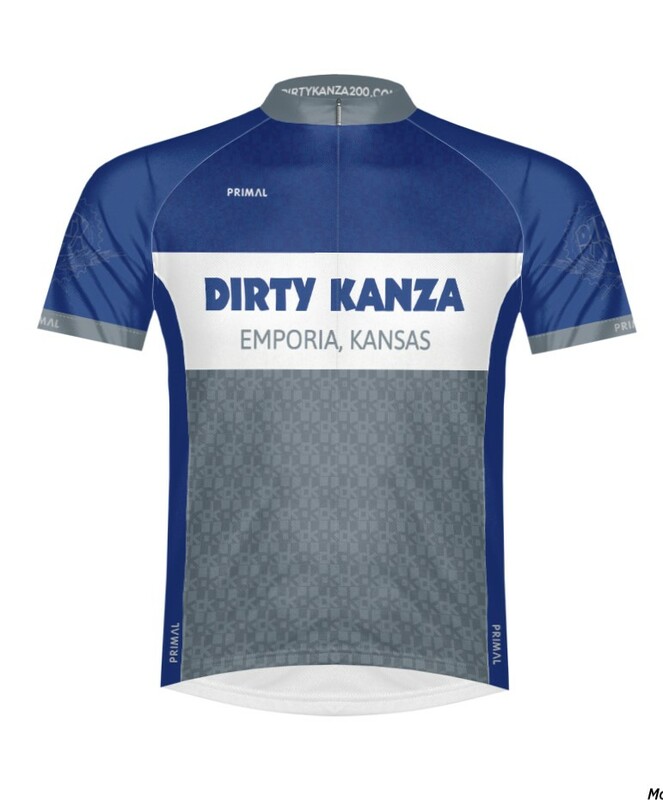 The highly coveted registration spots will go in a big hurry, but like anything, many times folks end up getting in to situations or experiencing life changes that prevent them from coming to Emporia Kansas for the event. At RidingGravel.com you can check out this thread on the forums especially set up to facilitate the exchange of information to help you find entries that are up for grabs. The entire process is carefully explained there, so check that out if for some reason you don't get a spot for the event. Also, we did a podcast where I interviewed LeLan Dains and Jim Cummings of the DK Promotions company. You can listen to what is up for the 2017 DK200 HERE. Thanks for reading all the gravelly news that was fit to digitize today. Have a safe, warm, and enjoyable weekend. Iowa license plate recycling project- Or in other words, fixing my bicycle part with what's at hand. The repair of my BarYak "wings" is complete now and I thought I'd show you all what I did here. You may remember my post from a couple days ago where I give you the story on the back ground and inspiration for this repair using some old Iowa license plate I had lying around here. So, if you reference the image here, you might be able to follow along with this. First off, the carbon fiber material you see here is simply ornamental. It serves little, if any, structural purpose for the design. The "wings", arm rests really, attach to the BarYak extensions via two bolts which pass through at the corners of the "wing" piece of the arm rest. This is what tore through when I crashed last October. The backing material here is a dense foam material which doesn't hold up well to the shearing type forces I applied to it when I endoed. My theory for the repair was to place some sort of an "end cap" over the edges of the "wing" part and drill two holes into the cap to accommodate the bolts. The end cap would be metal, harder to tear through, and be tougher and especially be able to provide a better clamping surface. However; as I contemplated the design, I realized that the foam material the "wing" was mostly made of would want to compress much easier than the metal end cap. So, I formed a 2/3rds cap. essentially what you see here, and the separate "back plate" would allow for compression of the foam bit. I have not field tested this yet, but I expect it to perform as I expect and the reinforced bolt holes should give my Bar Yak System new life. Stay tuned for an update later into Spring after this has been tested. 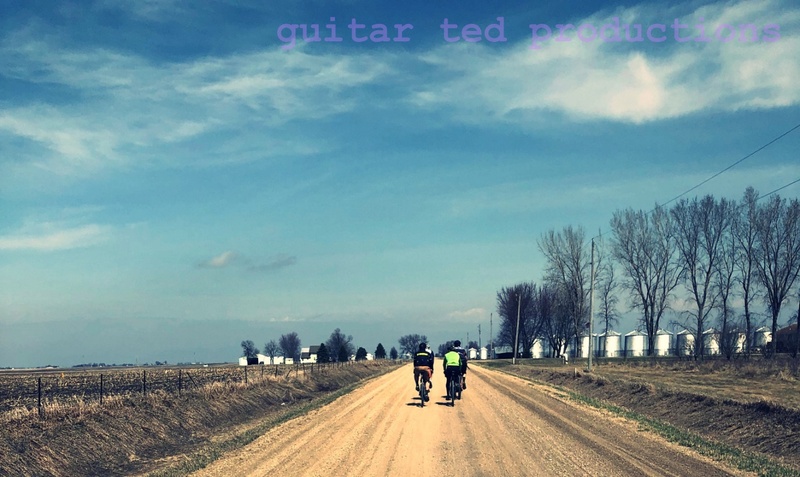 The gravel roads are clear in many parts of the world and I see that many riders are out there bagging big miles getting in shape for Trans Iowa v13. I'm still trying to tie up some loose ends before I can release some more news, but in the meantime, there are a few things that have cropped up which I would like to take care of now. If for any reason you know that you will not be coming to Trans Iowa, please let me know as soon as you can. This saves me and some of my volunteers a lot of work, time, and money. Volunteer Exemptions: I had a phone call the other day which has dialed up the need to clarify the parameters in which volunteers may exercise their right to a free spot on the roster. So, after some reflection, I have come up with a decision. In the past, I assumed that it was understood that if you wanted to exercise your right to get in Trans Iowa, you would do that during registration. Not two and a half months after registration has ended. It also has become quite obvious that several volunteers only volunteer to get into the event at some point, and that they really don't care about anything else. So, effective immediately, I am ending the volunteer exemption going forward. This means that anyone who volunteers this year won't get that "automatic entry" into a future T.I., if there ever are any. It also means that for any past volunteers they still have the option- once- to exercise their exemption. And then only before registration ends for the next T.I., if there ever is another. After that, I am all done with this facet of T.I. To be honest, I have people volunteering for Trans Iowa that really care about the event, and don't give a rip if they ever do the riding part. I have enough of these people every year that I don't really need more folks that only want the golden ticket in", as it were. So, while it may seem harsh, I need to make sure the intentions of my volunteers are true to the spirit of Trans Iowa, and not merely a hurdle to get over to get at what they really want. Velocity USA is back again and will be providing a wheel set to the finisher who gets through Checkpoint #2 on time and is the last one to do so. We've done this format before with another company and it works out well and is a lot of fun for the riders. Special Favors: Every other year or so I get asked for special allowances to get into Trans Iowa. I have been offered bribes of bottles of whiskey as recently as last night. I have had other offers and just downright cheeky requests to get in based upon "who the rider was". Look, you can probably guess how that went for all of those folks. So, while it is flattering to get these offers, I want you to know that I have zero intentions of ever accepting any future offers to bribe me for an entry into a Trans Iowa. As for those asking based upon "who they are", well...... No. Just no.